She’s not using the middle name anymore. Maybe that’s because it’s a new era. She’s her own woman now. But Hillary always had me at Rodham. Her father, Hugh, was a Navy chief petty officer who became a salesman, then started his own drapery business out of Chicago. And on the Howell side, her mother, Dorothy, was abandoned as a teen and later worked as a housekeeper. It’s the “Si se puede” for white people. But I heard it the first time from my Filipino Sunday school teacher at a Wesley Methodist Church near San Francisco’s Japantown. I heard it again during her acceptance speech at the Democratic National Convention. 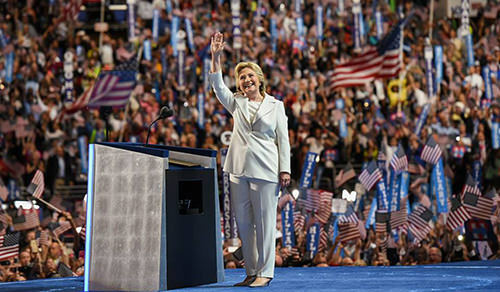 Hillary showed plenty of policy and attack, and a lot of throat clearing from the podium. It was a speech that set off so many responsive chords in me. All positive. All American. All part of the story you’d expect from the first woman to be president of the United States of America. Inclusive. Forward thinking. Positive. Patriotic. Strong. Sure, the gender thing made it incrementally historic. First woman nominated, not yet elected. But how many times did many of us discount the importance of all that during the primary campaign? I know many people who were Bernie supporters, and frankly, I had my tilt. But those who know my columns over the years know I fell for Hillary much harder in 2008, thinking that was her time. I remember going to a Clinton party in Denver during the 2008 convention. I was with a large number of Asian Americans who were crying in their beer. This time, they were elated. That got to me. But this time, I admit Sanders’ appeal just seemed more important. His Goldman Sachs jabs at Hillary made the point. Mega-money in politics combined with the economic inequality in society was making our democracy a joke. That’s some appeal. That’s why the most emotional moment for me during the whole Democratic convention was not Hillary’s great speech. It was really Bernie’s concession. 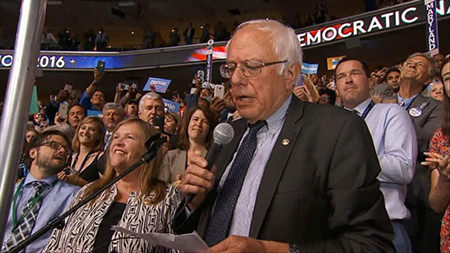 Not his speech from the podium, but rather his emotional remarks after the roll call on Tuesday. It was the simple act of declaring the suspension of rules to allow for Hillary to be the nominee by acclamation. That was as graceful and as magnanimous as it gets in American politics. And that was worth a tear or two. In this gridlocked, extremely partisan, take-no-prisoners, negativity-infused modern day of big money politics, when Sen. Ted Cruz couldn’t even endorse Donald Trump at the Republican convention, it was like a new day had come in politics. We can still fight and bicker, and then after some platform concessions, vow to work together toward a better future. That Bernie moment enabled Hillary’s speech on Thursday. And she hit all the points, invoking FDR rather than Darth Vader. It was really an old-style traditional Democratic speech. She spoke of the kind of infrastructure spending that creates jobs, the kind of thing that marked Bill Clinton’s years. All the economic issues. Minimum wage. Equal pay. And big money out of politics. So she appealed to Bernie and his supporters. And then she did her Trump Dump. Marco Rubio talked about Trump’s small hands and the GOP nominee started talking about his manhood. No class. But she made the stark contrast just a few seconds earlier. It’s the biggest single scary issue of a Trump presidency. Trump’s oversized cartoon hair as built-in mushroom cloud. If you saw both Hillary’s and The Donald’s speeches, it’s hard not to find Hillary more alluring from all sides. She was centrist and inclusive. If you’re a Bernie supporter and you think she’s too far to the right, well, she’s just defined a new big middle. Because if there are Republicans who find it distasteful to hold their nose and vote for Trump, now they can dump the nose clip. It’s hard to imagine a winning campaign slogan like, “We smell less bad,” but that may have to do if Hillary expects to woo a few moderate Republicans. In my previous column, I pointed out that since both candidates had such high negatives, this would be a different kind of campaign. The gender thing is a big deal too. But Hillary puts it in perspective. When Hillary said, “I’m happy for boys and men, too–because when any barrier falls in America, it clears the way for everyone,” it was inclusive. More important than gender is another barrier that prevents things from getting done in politics–the partisan barrier. “Even more important than the history we make tonight is the history we will write together in the years ahead,” Hillary said. It’s the sound of a new governing middle. It’s a Democratic Party, with some transplants from the right, infused with an essence of Sanders. And all of it furthered by the ineptitude and fear-mongering of a Republican substandard bearer. With a little more than 100 days left, an historic path to victory seems to be taking shape. And all of it in the name of democracy, led for the first time by the vision of a strong woman.